IU Southeast nursing student Brianna Smith demonstrates correct stethoscope placement with Angela Geswein at Guerin Woods. “Wouldn’t you want to be here?” asked Sister Barbara Ann Zeller. Amid the sounds of gentle laughter and the smells of home cooking, one would be hard pressed to respond with anything but yes. “Here” is The Villas of Guerin Woods, a unique residential care community for seniors in Georgetown, Ind., owned and operated by Guerin Inc./Providence Self-Sufficiency Ministries. Zeller is president/CEO and founder, and a nun in the order of the Sisters of Providence. Since August 2015, Guerin Woods has served as a clinical placement site for IU Southeast nursing students. “The partnership offers students an opportunity to hone their skills in the state’s first non-institutional geriatric care setting,” said Donna Bowles, dean of the School of Nursing. Guerin Woods is an intriguing blend of tradition and innovation. The tradition comes from the Sisters of Providence, the order founded by Saint Mother Theodore Guerin at Saint-Mary-of-the-Woods, Ind. in 1840. The community of Guerin Woods is a reflection of the order’s commitment to community service and education. The innovation comes from the “small house” model on which the community is based. Similar to the green house idea pioneered by William Thomas, and listed as one of the “top 10 movements in long-term care” by Long Term Living magazine, the small house model is part of a revolution in residential care culture that is replacing the institutional environment with a home setting. Guerin Woods, opened in 2005 with one pilot unit, now encompasses 22 apartments for individuals and couples age 62 and older, and 8 villas on the small house model that provide licensed assisted living and skilled nursing care for frail elders age 62 and older. In contrast to large hospital-like compounds housing hundreds of people in identical rooms on endless hallways and staffed from a central desk, the villas resemble a condo complex, with individual one-story homes of eight to ten elders whose private apartments cluster around a central communal living space. Instead of a mealtime fixed by a commissary, there is an open kitchen and big family-style table. Elders, most of whom have been providers their whole lives, get to cook for themselves and their housemates when they choose, filling the air with the welcome smell of cookies, bread and more. They have access to Wi-fi, computers are available and outside there are gardens for them to tend. Staffs are not vast hierarchies but small teams of nurses and multi-skilled workers called compatissants who are capable of providing whole-person care. There are no uniforms or bells (wireless pendants, instead) and the elder-to-staff ratio is very low. 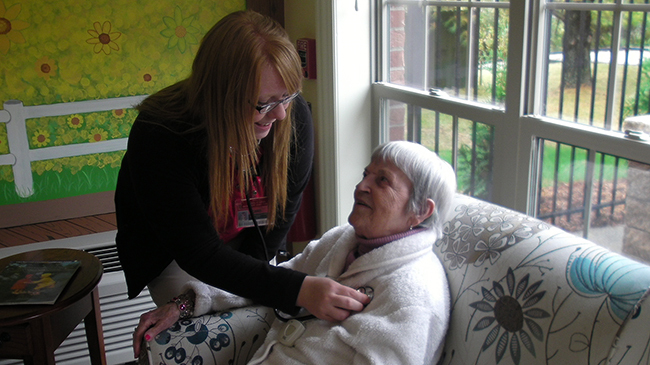 “We become fond of those in our care,” said Zeller. While Zeller and her board were expanding the vision for Guerin Woods as a whole, Assistant Director of Nursing Kelly Hampton became the driving force behind the partnership with IU Southeast. Hampton was already working at Guerin Woods while completing the RN-to-BSN program at IU Southeast. With the encouragement of her faculty member, Dr. Judy Myers, she began to see the potential benefit to students of an exposure to the concepts and ethos of the community. Elder Les Krick and IU Southeast nursing student Shelby Lucas engage with IN2L technology for seniors as Bernice Davidson enjoys her Music and Memory i-Pod in the background. Bowles was intrigued by the advances at Guerin Woods, and saw the possibility to place students at the forefront of their industry. For her part, Zeller recognized an opportunity to further her order’s commitment to education while serving the interests of the residents. Clinical placements are the core of any nursing program. Over the years, IU Southeast has established excellent working relationships with top providers in the region, to ensure that graduates receive an experience that broadly reflects the realities of the industry, deepens their understanding of the responsibilities involved in nursing, and helps them make key contacts in the field. Guerin Woods offers a placement of a different sort, affording course objectives that are not possible at other long-term care agencies, said Bowles. For example, students are able to experience the small house model, debunk myths about aging, learn therapeutic communication techniques for residents with dementia, and compare and contrast generational differences and their potential impact on healthcare, among others, she said. 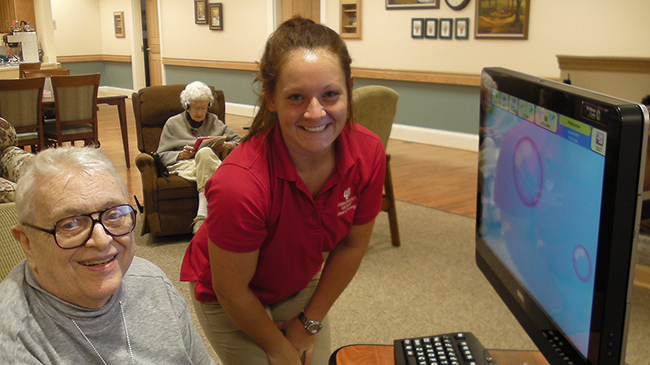 DeAnna Whittinghill, a senior from New Salisbury, Ind., and her group assessed Guerin Woods from the standpoint of community health, and invested time in designing intergenerational activities involving elders and the family groups living at nearby Providence House on the same campus. She valued the level of autonomy she and her fellow students were given to implement their ideas. This made her feel respected. Everyone involved believes that the elders also gain from the placement, often in unexpected ways. That importance sometimes enables the elders to turn interactions with the students into teachable moments. They often draw new students into their own treatments, helping them become practiced at basic care procedures. IU Southeast nursing student Jacob Outcalt visits with Adalyne “Addie” McDonald at Guerin Woods. Together, Zeller, Hampton, Myers and Bowles are continuing to explore new avenues of collaboration to benefit students and elders. One project involves a memory café – a nonjudgmental meeting and social interaction space for individuals with Alzheimers. Zeller has already developed one of the villas into a state-of-the-art residence for elders with Alzheimers, and would like to expand in response to the anticipated growth of this segment of Indiana’s population. Nancy Melton, a senior from New Jersey and a pediatric nurse at Kosair Children’s Hospital, and fellow student Doris Baker worked with Hampton to assess the need and feasibility of the cafe, and presented a promotional plan as their class project. They will submit the proposal officially to Zeller in the spring, and if all goes well, host a memory café at the Guerin Woods senior center. Chaisson echoed the feeling of many students that the placement has given the students not only an exercise in compassion and thankfulness, but a chance to make a difference in the lives of the elders. “We felt that we made an impact at Guerin Woods, and set a building block for IU Southeast students for years to come,” she said. 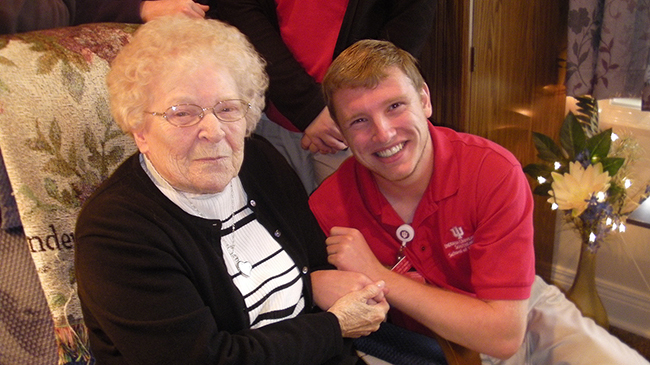 Homepage photo: IU Southeast nursing student Christian Mattix with elder Delma Lamb at Guerin Woods.